Welcome to your one-stop resource for all things Hammond Real Estate! In 1847, at the south end of Lake Michigan, German immigrants settled the region between the Little Calumet and Grand Rivers. It wasn’t until a certain butcher by the name of George H. Hammond brought his meat packing business to the area that the region adopted its permanent name and incorporated in 1884. Today Hammond is a destination for avid gamers, both local and those escaping the big city, and whether you work locally or your career takes you via easy commute into the big city of Chicago, it’s a place many call home. 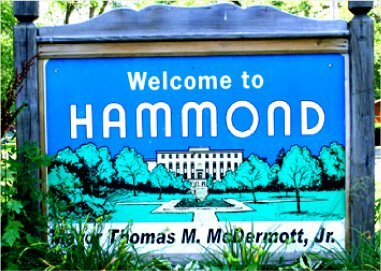 Are you ready to call Hammond home? Contact our outstanding agents at Jana Caudill Team for available listings. The Horseshoe Casino is located right on the shores of Lake Michigan in Hammond. Popular attractions in the casino for gamers include slots, table games, poker room, lounge, buffet, Jack Binion’s Steakhouse and more. Looking for something to eat? If you like pizza Hammond in the place for you. There are national chains as well as local Mom and Pop pizzerias. Check the complete listing in the Hammond Restaurant Guide. One of the local favorites is the Carlson Oxbow Park, named after the veteran city Councilman George W. Carlson who spearheaded the park’s development, and the bend, or “oxbow,” in the river forming the park. The park features 89 acres of woods and wetlands, and plenty of native bird and animal species. Hammond is also home to the world renowned Lost Marsh Golf Course. Lost Marsh features a world class 18-hole public golf course as well as a 9-hole executive course. There is a driving range, lounge, and pro shop. According to City-Data.com the median household income for Hammond homes from a 2016 study shows an income of $46,260 compared to $52,314 for all of Indiana. Median home values for Hammond in the same time frame were $87,000 compared to $134,800 for the rest of the state. For current, up to date information on homes for sale in Hammond visit these links or contact our office to set up an appointment. The Franciscan St. Margaret Health Center is located in Hammond at 5454 Hohman Avenue. Other medical centers and hospitals near Hammond include the St. Catherine Hospital in East Chicago (Indiana), The Community Hospital in Munster, and the Franciscan Physicians Hospital, also in Munster. The Amtrak Hammond-Whiting Station is located at 1135 Calumet Avenue. The South Shore Electric Line has a station on Hohman Avenue. The Gary/Chicago International Airport is the nearest commercial airport. City bus transportation is available through Northwest Indiana Regional Bus Authority. Purdue University Northwest and Kaplan College maintain their campuses in Hammond. As well, there are many other higher education opportunities within easy driving distance of the city. South Suburban College, City Colleges of Chicago-Olive-Harvey College, Indiana University-Northwest, Prairie State College, Ivy Tech Community College-Northwest, Chicago State University, and Saint Xavier University are all within 14 miles of Hammond. Check out these links for Hammond Public Schools for current information on local public elementary, middle/jr. high, and high schools. Whether you have a question on buying a home in Hammond, selling a home, or any other Hammond, Indiana Real Estate question please call or email us. We’re always happy to help!